EXPECTATIONS for sluggish economic growth this year are firming, with the nation’s peak private-sector grouping flagging potential hits to exports and tourism from the prospect of simultaneous slowdowns in China and the United States and the trade war they are waging. Investment applications outstripped the goal of 720 billion baht in 2018, bolstered by higher investments in targeted government industries. Thailand on Wednesday (Jan 9) welcomed a decision by the European Commission to drop the Southeast Asian nation from a list of countries it had warned over illegal and unregulated fishing. Prime Minister Prayut Chan-o-cha has urged relevant authorities to seek opinions from the Constitution Drafting Committee (CDC) when determining the poll date, according to the premier’s close aide. Sydney – Australia gave its strongest hint yet on Wednesday that an 18-year-old Saudi woman in Bangkok would be granted humanitarian asylum, despite efforts by Riyadh and her family to force her return home. Thailand’s long awaited and repeatedly postponed general election under junta rule may be delayed yet again after the interior ministry confirmed a halt to preparations for polls expected on Feb. 24, saying it was still waiting for a voting date to be made official. On Tuesday, the Thai Cabinet resolved that all financial donations supporting the recovery of storm-hit provinces in the south are tax deductible. Labor rights campaigners warned against complacency as the European Union withdrew its threat on Tuesday to ban Thai fishing imports into the bloc, saying that the country has made progress in tackling illegal and unregulated fishing. About 200 protesters staged a demonstration in Bangkok on Tuesday, demanding that there be no further delays in holding elections, which are expected next month but have been put in doubt. 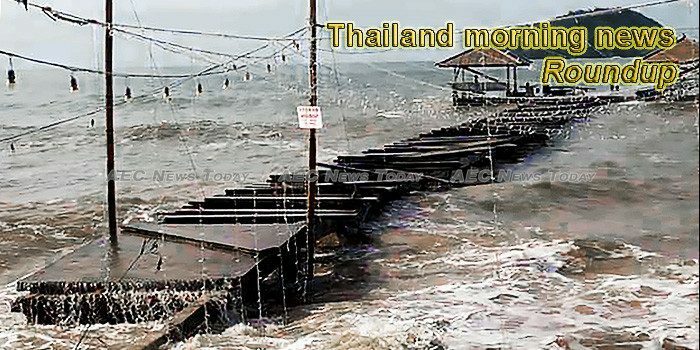 Thailand’s Ministry of Commerce has introduced four measures to ease the plight of southern businesses impacted by Tropical Storm Pabuk. The Barisan Revolusi Nasional (BRN) guerrillas were responsible for Tuesday’s car bomb in Songkhla’s Thepa district, according to Deputy Prime Minister Prawit Wongsuwon, as three suspects were detained yesterday. Four days ago, 18-year-old Rahaf Mohammed Alqunun fled the watchful gaze of her family and boarded a flight to Thailand on a quest to seek asylum. Sydney – The United Nations has found that a teenage woman who fled Saudi Arabia is a legitimate refugee and has asked Australia to take her in, officials in Canberra said Wednesday. Corporate filings in Hong Kong revealed Yingluck, 51, had used a Cambodian passport to register as the sole director of P.T. Corporation Company, a firm incorporated in the city on August 24 last year, almost a year to the day after she went into self-imposed exile ahead of a sentence for criminal negligence. Leading figures for Phuket’s tourism industry say that the island has dodged any major economic impact from the fallout of tropical storm Pabuk passing through the region. Since 2014 Thailand has been under the power of a military junta called the National Council for Peace and Order (NCPO). Prior to the coup d’état, the military junta had conspired with an undemocratic group to destroy the democracy without regard to the rule of law, claiming the takeover was in the name of unity. The Department of Health launched its official air quality index yesterday (Jan 9) in order to give accurate risk readings for residents of Bangkok and its surrounding area, who have been affected by the increasing concentration of micro pollutants in the atmosphere in recent weeks. Thailand Today 028: Rice Moisture Meters to protect farmers and create fairness in rice trading. The government has recently upgraded quality standards of Hom Mali Rice (Jasmine rice) fragrant rice in a move to highlight the identity of Thailand’s premium long-grain fragrant rice. B. Grimm in collaboration with BMW (Thailand) hosts BMW – B. Grimm Thai Polo Open 2019 to win HRH Princess Maha Chakri Sirindhorn Cup on Saturday 19 January 2019 at Thai Polo & Equestrian Club from 12.00 pm onward. Thailand’s offshore oil and gas operations have returned to normal this week after they were suspended due to Tropical Storm Pabuk hitting the region over the weekend. Thailand’s Immigration Police chief says the father of the young Saudi woman who fled her family to seek asylum abroad denies physically abusing her or trying to force her into an arranged marriage, two of the reasons she gave for her flight. ONLY A DAY after students at prestigious Bangkok Christian College were allowed to wear casual clothes to class for the first time, the Office of the Private Education Commission (Opec) yesterday sent a letter asking the country’s first private boys’ school to reconsider whether such a move was appropriate. The Prime Minister has thanked all involved in helping Thailand shed the yellow flag placed on its fisheries industry by the European Union, saying that the sector will only continue to improve. Prime Minister Prayut Chan-o-cha has rejected former parliament president Yongyuth Tiyapairat’s suggestion that the government hold talks with fugitive ex-premier Thaksin Shinawatra for the sake of restoring national unity. The Stock Exchange of Thailand (SET) expects continued volatility in capital markets due to the trade dispute between the United States and China, but foreign investor confidence in Thailand remains strong due to the country’s robust economic foundations and profit growth among listed companies. Business operators expect no major impact on the economy from election delays and pin their hopes on government investment to drive gross domestic product again this year. A disaster relief caravan of vehicles has been dispatched from Bangkok to the southern region to aid victims of Tropical Storm Pabuk. Members of the National Legislative Assembly (NLA) are monitoring the implementation of the Thai Niyom Yung Yuen (ไทยนิยมยั่งยืน) projects in Ban Pong (บ้านโป่ง) District in Ratchaburi province, such as an extension to the local hospital. A twelve-year-old schoolgirl was raped, a medical examination revealed, and a police investigation report implicating a teacher in Chai Nat is expected to be submitted to prosecutors on Friday, police said. In keeping with the Kingdom’s progressive stance on LGBTQ rights, a major art exhibition exploring gender rights in Asia is to be staged in the capital. Seeking to purge all the âbad applesâ, the Royal Forest Department (RFD) is trying to determine whether six of its officials recently sacked for selling protected phayung (Siamese rosewood) to a Chinese investor had links to a transnational logging and smuggling gang and whether any other officials were involved. A car bomb explosion in Songkhla’s Thepa district yesterday has shocked locals after insurgents are suspected of killing a 62 year old school teacher and stealing his pickup to be used in the the attack. Ride-sharing service Grab plans to expand to key areas in Thailand in 2019, most notably Chiang Rai, hoping to achieve nationwide service in the next 2-3 years, a goal that could be expedited by the upcoming election. The government on Wednesday added medicine, medical supplies and medical services to its price control lists to ensure fairness for both patients and operators of private hospitals, the commerce minister said. Six prison officers have been dismissed by the Department of Corrections (DOC) following involvement in a varied and disturbing range of transgressions. Kittiphun Anutarasoti, chief executive of CIMB Thai Bank (CIMBT), is crying foul over the probe made by Krungthai Bank (KTB) into previous loan extensions to Energy Earth after the findings made serious allegations against him. The team of four students from Trat Polytechnic College won the Top Grade Award at the 11th International Collegiate Snow Sculpture Contest 2019 in China. Five foreigners were arrested for visa offences during raids in Bangkok, Chiang Mai and Surat Thani from Dec 26-Jan 8.